Artist Gina Adams will be presenting her lecture, The Object and the Shadow of Other Peoples Stories, at the Southern Utah Museum of Art on Thursday, September 7th at 7:00 p.m. for the SUU Department of Art & Design’s Art Insights series. Adams will discuss how art can be a bridge between ourselves and heritage and talk about her Native American culturally based artwork. Admission to Art Insights is free and open to the public. 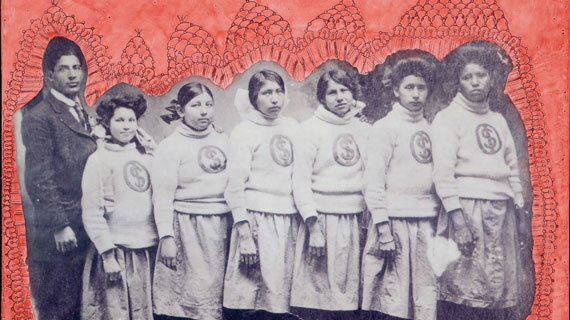 Adams is best known for the reuse of antique quilts featuring the words of broken treaties between the United States and Native American tribes, however, her works span a wide range of artistic styles and mediums including sculpture, ceramics, painting, printmaking and drawing. Russell Wrankle, Assistant Professor of 3D, Sculpture, and Foundations at SUU College of Performing and Visual Arts, brought Adams to our community because, "Gina is an elegant and graceful educator and artist, she chooses media that best serves her idea. I also felt that her perspective and point of view as a Native American Artist is needed in our community." Her work is exhibited extensively throughout the US and resides in many public and private collections. In 2015 Nerman Museum of Contemporary Art launched her art career with Its Honor Is Here Pledged and Broken Treaty Quilts. In 2016 she was SARF Smithsonian Artist Research Fellow, and had Its Honor Is Hereby Pledged exhibitions in Boulder Colorado at Naropa University’s White Cube Gallery where she is a Faculty in Visual Arts. In the summer of 2017, Gina presented and exhibited at the AIW Conference at Goldsmiths College, University of London, England. Gina's formal education includes a BFA from the Maine College of Art and MFA from the University of Kansas, where she focused on Visual Art, Curatorial Practice and Critical Theory. Art Insights is hosted during the fall and spring semesters by SUU’s Art & Design faculty. Students and community members meet to experience presentations and discussions by visiting artists and art educators from around the nation who share their work and insights. Be inspired by Gina Adams as she shares the personal and historical story of her ancestors through her artwork. For more information, please visit www.suu.edu/pva.